Looking for something outside the box with extras. This beautiful 10 yr new Executive home located between Brighton & Trenton. Has it all, amazing location with Timber Ridge golf course just 3kms away. Easy access to Highway 401 & Highway 2. Making it a very short drive or bike ride to either Brighton or Trenton. Elevated 1.03-acre lot overlooking the few neighboring houses that are close to you and a large wooded area coming right up to the back of the property. Large deck with southern exposure and an above ground pool with optional heater. This spacious home has both floors completely finished offering almost 3000 sq ft of total living space. Two large bedrooms upstairs. Master bedroom with massive walk-in closet. Open concept floor plan combining living, dining room and kitchen with island. Dining room has patio door to a South facing elevated deck. Fridge stove, dishwasher & microwave included for Tenants use. Spa-like main floor bath with jacuzzi corner tub and stand up shower. Downstairs is comprised of 2 more large bedrooms with oversized windows for additional light, Utility room with Hi efficiency propane furnace, HVAC and Central air and vacuum. Laundry room with newer laundry machines. 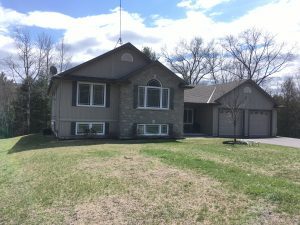 Full 4 piece bath and another large open concept very inviting family room with propane fireplace and bar. Available starting Aug. 1, 2018, and for up to 4 full years to the right applicant. Rent is $2200 a month plus propane & hydro. Propane approx $1515 to heat last year. Hydro approx $155 per month. No water or Sewer charges. 2-year lease minimum but home is available for a maximum of 4 years. Landlord will pay the propane tank rental cost and supply UV light and salt for water softener. Double attached insulated garage with dual automatic garage door openers and inside entry. Lots of additional parking and storage. All applicants will be screened through Naborly, an online screening service & will be subject to a credit check. First & Last months rent & good references a must. Smoke-free home. So absolutely no smoking indoors. Tenant will be responsible for their own rental insurance Tenant will also be responsible for maintaining lawn and driveway but riding lawn mower and snow blower available if required. The landlord is looking to sign a 2-year minimum lease. For more information or questions or to request an application, simply email leaveittojandt@gmail.com and leave us your name and email address and we will send you a naborly application right away. Applicants who pass the naborly application will be contacted for a showing at their convenience. Don’t miss this gem. Lawn tractor and snow blower available for use if required. Dug Well, softener, UV light. Deck, Exterior Lighting, Above ground pool.